Mobius wedding ring in 18ct white gold and diamonds. Our customer wanted a wedding ring that would allow her single stone diamond ring to sit snuggly up against it. But she also wanted the ring to look good when worn on its own. Our Mobius wedding ring ticked both the boxes. A Mobius strip is a single continuous band, which has only one boundary. It is a clever mathematical form, which has curious properties. If an ant were to crawl along the flat surface of this ring, it would return to its starting point having traversed the entire length of the strip, both inside and out (on both sides of the original band) without ever crossing an edge. As well as being interesting mathematically, it forms a very pleasing shape. A pure sculptural and fluid line, which rises to the height of its own width, at the point where it twists. We were able to set tiny, fully cut brilliant diamonds into the edge of this ring. They added extra sparkle and zing to the elegant design and worked well with the large diamond, which was in the lady’s single diamond engagement ring. 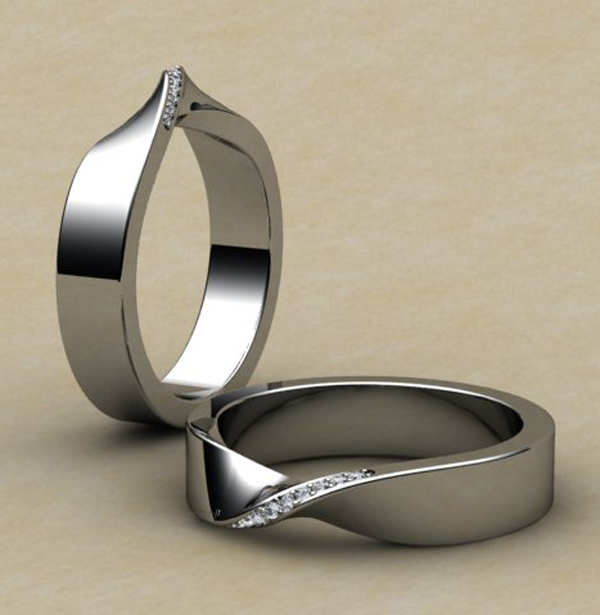 We have made Mobius wedding rings before, but not produced one with the diamond accents.